An essential text for understanding Socrates, Xenophon's Memorabilia is the compelling tribute of an affectionate student to his teacher, providing a rare firsthand account of Socrates' life and philosophy. 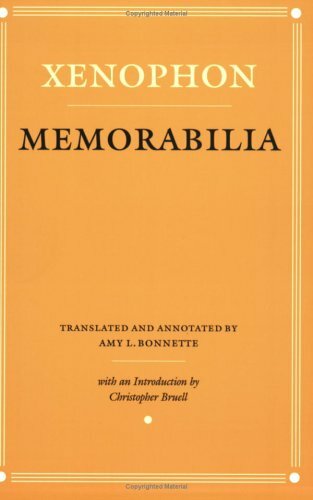 The Memorabilia is invaluable both as a work of philosophy in its own right and as a complement to the study of Plato's dialogues. The longest of Xenophon's four Socratic works, it is particularly revealing about the differences between Socrates and his philosophical predecessors. and the Spartan king Agesilaus, all of whom he wrote about with an air of close personal knowledge. His works include the autobiographical Anabasis, an account of his service with a mercenary Greek army that marched from Mesopotamia to the Black Sea after the defeat and death of the younger Cyrus. It provides the most detailed single perspective on the military practices and military mentality of Xenophon's age. His Hellenica, by contrast, is an impersonal continuation to the end of the Peloponnesian War of the work of Thucydides and a patchy memoir that concentrates on Sparta's fortunes until the definitive end of its power in 362 b.c. Xenophon's other major works are the Cyropaedia and the rambling Socratic dialogues known as the Memorabilia. The Cyropaedia is a fictional idealization of the career of Cyrus the Great, the only great conqueror known to the Greeks before Alexander. Often regarded merely as a novel, it is a species of a priori historical reconstruction. A retrojection of the military science and political values of the day into a largely unknown Persia of the past, it is intended to explain Cyrus's success on rational principles. The Memorabilia and the Socratic Apology that comes down with them contain nothing of philosophical value but are thought by some scholars to offer a possible corrective to Plato's altogether too Platonic Socrates. Xenophon had a conventional and second-rate mind, but he is a valuable resource because of his mediocrity. He enables us to make contact with an ordinary intellect from a world that often seems dominated by geniuses.